PHUKET: Bars on Bangla Rd and other main entertainment areas of Patong have been asked to be respectful this Saturday (Oct 13) as the nation commemorates two years since the passing King Bhumibol Adulyadej. Weerawit Krueasombut, President of the Patong Entertainment Business Association (PEBA), which represents some 500 entertainment businesses in Phuket’s busiest tourism party town, confirmed to The Phuket News today (Oct 9) that members of his association had yet to be informed of any ban on the sale of alcohol this weekend, or on the Monday (Oct 15), which will be the substitution public holiday. However, Mr Weerawit added, “We have asked our members to be respectful and to have the colour yellow worn to respect King Bhumibol. “At this stage we have not asked members to do anything more than that, though this may be discussed in more detail soon,” he added. 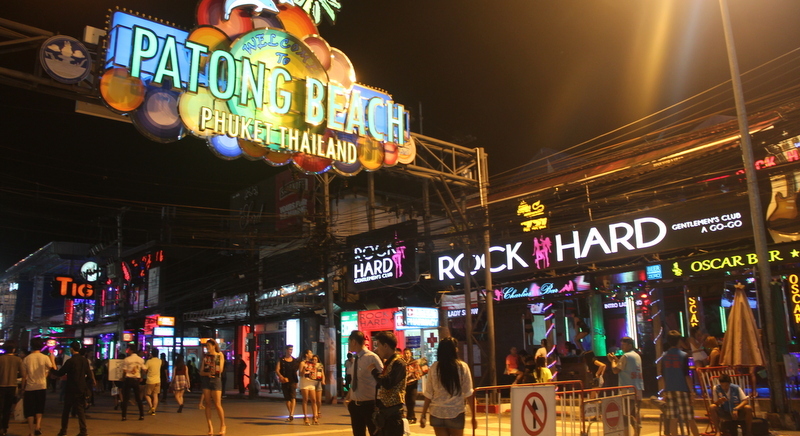 Lt Ekkaluck Plaidong of the Patong Police confirmed today that no official order had been received for police to curtail the sale of alcohol or any other entertainment activities in Patong. “We are still waiting for the Kathu District Office to hold their meeting about this and inform us of any decisions made. Until then, bar owners can continue with the business as usual,” he said. However, Lt Ekkaluck also cautioned businesses to be respectful of the holiday. Col Sermpan Sirikong, Deputy Commander of the Phuket Provincial Police, also confirmed that his officers had not yet received any order banning the sale of alcohol over the holidays. “There has been no circular issued by the Ministry of Interior on this, and as the law mandates currently bans the sale of alcohol only four (religious) holidays and election days, it is up to the operator whether to sell alcohol or not,” he said. “If tourists or other foreigners need to drink they can, but if the operator wants to show respect by closing or suspending some of their services they can, but if they do, then where can tourists or foreigners find a place to drink?” he posed.